Fred believes he lives in the perfect environment for creating his art. In Strafford, New Hampshire, surrounded by rolling hills, tall trees and many species of wildlife, he creates decoys in the traditional manner. A lifelong resident of New Hampshire, Fred grew up on the Salmon Falls River in Somersworth. This influence shaped a deep interest in nature and ultimately in creating wildlife art. He was educated in local schools and graduated from The University of New Hampshire in 1971. Many years ago, Fred began carving as a hobby. Since the early 1980s he has been working full time at his art. Each of Fred’s works is hand carved and detailed from Northern White Cedar, hand painted in his own style and interpretation, and when appropriate rigged in the traditional manner. Fred is a state juried member of The League of New Hampshire Craftsmen and routinely serves as a juror for new applicants. He has also been a member of the New Hampshire Woodworker’s Guild, The Cape Ann’s Artisan’s Guild and The National Woodworker’s Association. He frequently exhibits his work throughout New England and the East Coast, having won many awards. The New Hampshire State Council on the Arts has recognized his work since 1994 by awarding him Traditional Arts Apprenticeship Grants as a Master Carver. 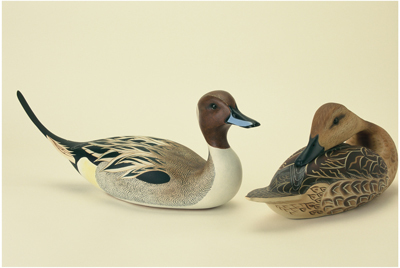 In April of 1996 Fred won a Best of Show at the prestigious Ward Foundation World Championship Wildfowl Carving Competition in Ocean City, Maryland. He has also won Best of Show as well as many first place awards over the years in carving competitions both regionally and nationally.